This post was EXCELLENT and just what I needed to read!! Thank-you for sharing. 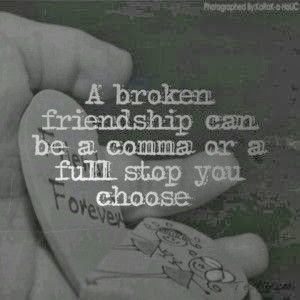 I think friend break-ups can often be harder then romantic break-ups! Thank you! Glad to hear it! You're very welcome. And yes, I agree. At times, they can be. You're welcome. I hope it blessed you. You're very welcome! Praise the LORD that it blessed you. Hope your week gets better. I really needed to read this today. And I can't help but think about Job ... When all his friends accused him when he did nothing wrong (and even his wife did not support him!). Words hurt. But not just the words of a stranger, but the words of those we love deepest, those we trust freely, those we care about that we would do just about anything for them. But as I walk through a more lonely season of my life, I learn, over and over again, to realize that God will never leave me (Deut. 31:6), even if friends do. I learn to trust fully in God, and that, in a friendship, my goal should be to love them with the same selfless love that Jesus has shown to me, even when I have hurt Him. Glad to hear it was perfect timing for you. And yes, exactly. I'm happy to see that you are learning to trust Him more fully. Oh! You're THAT Rachel! haha You're welcome:) Thanks for being a reader - and for commenting! I'm glad people are so excited about it haha I would've started doing it sooner if I had known people would for sure check back for replies. Praise the LORD!! That is SO encouraging to hear!